Following up the previous post on the F/W collection, here are some closer looks at the shoes. 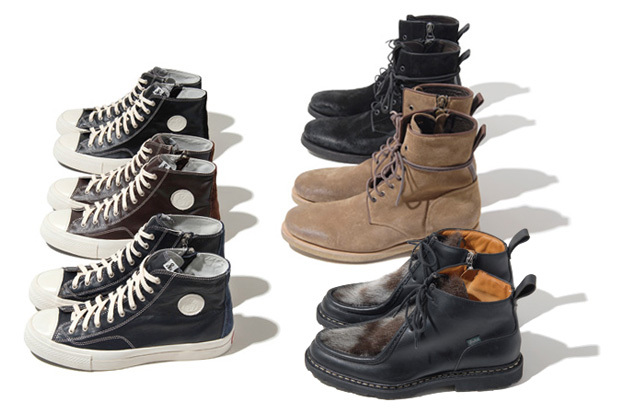 They are all collaborations with other brands such as Danner and visvim and all models are made exclusively for Sophnet. Basic footwear looks, but still different enough to call for some attention. Visvim is one of my favorite brands, due mostly to thier academic persuit of the fundamentals of footwear and what makes a shoe great. The obsessive attention to detail is prevailant in every single pair I've purchased through the years and has cemented me as a lifetime customer (as long as they keep it up). highlights of the collection include the black/white contrast Danner waffle stomper hiking boots with the green laces, the black side zip leather boots and the black converse look alikes made by visvim. More info here. Labels: a/w '09, boots, Danner, footwear, japan, Sophnet, sophnet.